$2 Bluetooth Speaker technical review | Michael Hirsch, Ph.D. 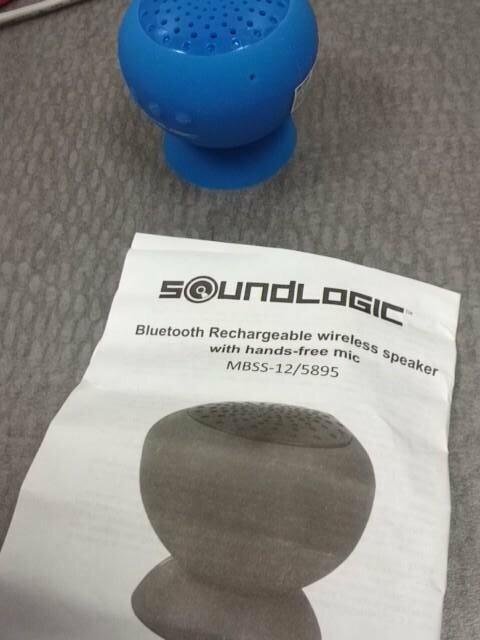 The SoundLogic Suction MBSS-12 Bluetooth speaker sells individually for $5, and in bulk they can be purchased for $2. The speaker is comfortably audible at a distance of several meters, even outside, so it can be a nice inexpensive gift that is considerably better (louder, fuller fidelity) than a smartphone speaker. Battery life is a couple hours and it has micro-USB charging. It has a microphone with profiles for two-way headset as well as higher fidelity A2DP audio. The speaker plays nice with Linux as just about any device would these days (better than Windows in general). Maximum range for this SoundLogic Bluetooth speaker was 10-12 meters in outdoors, line-of-sight conditions with dozens of background Wifi APs at -80 to -70 dBm. The antenna is a meander-line with 2 dBi claimed gain. Given the +1dBm conducted transmit power, about +3 dBm EIRP for this speaker. Remember that EIRP is just one piece of the pie when it comes to maximum range. I’ll assume the transceiver is well designed, -90 dBm or better RX sensitivity. Why then is the range of this $2 bluetooth speaker so much worse than the $120 CreativeLabs Roar 2? Because of antenna placement–on the $2 SoundLogic, the meander line antenna is jammed in right behind the buttons, and so the theoretical donut-shaped pattern with nulls off the longways ends of the antenna are complemented with nulls front and back of the speaker. I didn’t simulate it, but it would be some weird 3-D clover-leaf like pattern. This is why better Bluetooth speakers use dual antennas placed more optimally in their devices.